The 40th President of the United States, Ronald Reagan is among the most popular, and he was supported by voters from both parties. During his term, he implemented sweeping new political and economic initiatives which led to remarkable economic expansion, the ending of the Cold War, the fall of the Soviet Union, renewed American pride and patriotism, and greatly improved U.S. wealth and prosperity. 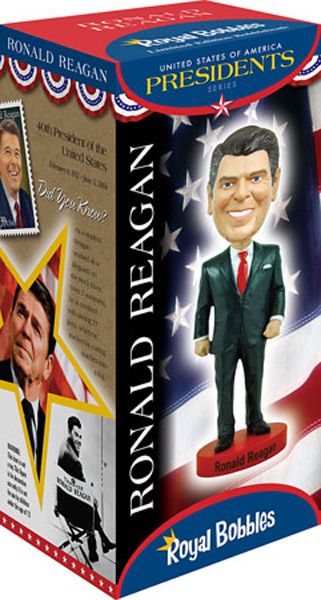 This remarkable bobblehead is the highest quality Reagan doll that has ever been produced. It comes in a colorful collectors box and would be a wonderful addition for any collector.